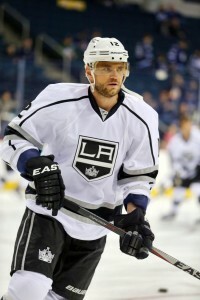 Will Marian Gaborik Re-Sign With the Kings? Calvin: Hobbes, I have a conjectural moral question. Maybe you can help. Calvin: Suppose I did something bad. Should I tell Dad? Hobbes: How bad are we supposing? Calvin: Well, hypothetically, let’s say pretty bad. Like to his car, hypothetically. Hobbes: How bad, hypothetically, to his car? Calvin: Well, let’s pretend it was real bad. Hobbes: Should we pretend it could be fixed? Calvin: If we imagined he could find the car, we could pretend it could be fixed. In the last panel, both are running, with Calvin reading from an English-to-Spanish dictionary and Hobbes holding a suitcase. Hobbes: You can keep the book. I’ll call the bus station. Perhaps the moral to the story is that we just don’t know until it happens, which makes guesswork highly conjectural at best. However, since speculation is a big part of what we do within these pages, it’s time to rinse and repeat: after this season, will Marian Gaborik re-sign with the Kings? There’s no question Los Angeles had a pressing need for a legitimate sniper at left wing when they traded for Gaborik. As I have chronicled repeatedly in these pages — most recently in my open letter to Anze Kopitar urging him to step up his game — the Kings offense needed serious help. Durability and age questions notwithstanding, the skills Gaborik brings should fit like a glove in goal-starved Los Angeles. That need isn’t going away anytime soon. Dustin Brown may just be having a bad season, but he may also be showing the wear and tear of nine rugged NHL seasons as a somewhat-undersized power forward. Although he can play both sides, he’s arguably more of a natural right winger. Dwight King has stepped it up this year, but most believe his best fit is on the third line. Tanner Pearson is just 21. Trevor Lewis isn’t an answer, nor is Kyle Clifford. If anything, the Kings may be in the market for two additions on the left side. Retaining Gaborik would obviously cut that number in half. Will both Gaborik and the Kings be willing to make a deal? That, of course, will be the multi-million dollar question. Every team has had examples of players they traded for that should have worked out, but for whatever reason, did not. Conversely, sometimes a player just isn’t willing to stay with the team they joined and cashes in a one-way ticket out of town at the first opportunity. There’s no way to know which way the winds will blow with respect to Marian Gaborik. There appear to be three competing factors in play. The Kings are a grinding, dump-and-chase team that emphasizes defense. Gaborik is a speedy sniper who brings instant offense and yet will never remind anyone of Pavel Datsyuk defensively. Can Tab A fit seamlessly into Slot B? Age and slow start notwithstanding, few think that Gaborik won’t get it going soon for the Kings. Even fewer believe he can withstand the rigors of the NHL for long without sustaining yet another injury. Will the desire to win the Cup trump all else? Now 32 years old, Gaborik is in the last year of a five year contract he signed in 2009 which paid him $7.5 million per season. Logic dictates that his next deal will likely be for less money and a shorter term, as his age and arguably diminishing production warrant both. Furthermore, most players in Gaborik’s skates emphasize winning a Cup at this stage of their careers. This isn’t to say money won’t be an important factor, but having made the playoffs just five times in twelve previous campaigns, priorities tend to shift. Winning a Cup with Los Angeles over the next several years would seem to be a pretty fair bet. In that regard, so would joining Pittsburgh, Boston, Chicago, St. Louis, Detroit or a handful of other clubs. However, with nearly $6.5 million slated to come off the books via the pending free agency of Matt Greene and Willie Mitchell, Los Angeles should be in prime position to re-sign Gaborik. Assuming, of course, both sides are willing to make a deal. It goes without saying that the final fourteen games of the regular season and the impending playoffs will be the keys to whether or not both Gaborik and the Kings decide his future should reside in Los Angeles. It will cost them a conditional third round pick if they do (unless the Kings win a first round playoff series, in which case the third vests automatically), as well as all the risks and rewards a new contract brings. However, with the intrinsic bidding wars of open free agency, little immediate help in the pipeline and the chances for the Cup in sunny Southern California, both sides have a few very good reasons to consider sitting down when the season is over. As Spike Milligan once said, “All I ask is the chance to prove that money can’t make me happy.” Assuming he produces, Kings fans hope that’s exactly how Gaborik feels this summer.